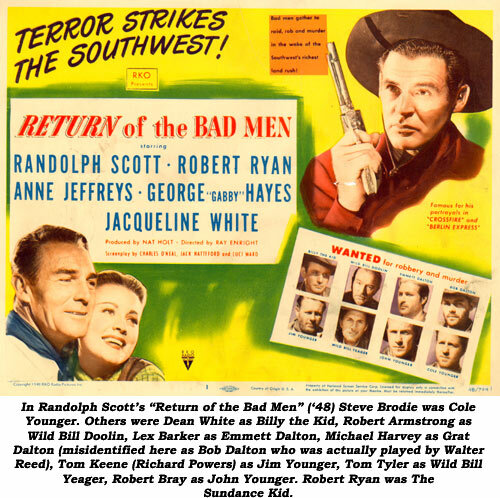 One of the latecomers to westerns, Steve Brodie’s first time in the saddle was as Bob Dalton in Randolph Scott’s all-star-outlaw adventure, “Badman’s Territory” in 1946. Steve was born John Stephens in El Dorado, Kansas, November 25, 1919. His father, Alexander Lewis Stephens, was from Ohio, and his mother, Lena Blanche Daugherty, was a native of Illinois. As a teenager in the midst of the Great Depression, to his way of thinking, the best jobs were the flamboyant ones, so Steve raced cars, worked on oil rigs, boxed and made bootleg whiskey. He aspired to be a criminal lawyer, but when forced to drop out of school decided to try acting. Auditioning in New York, he found nothing for over a year using the name John Stephens. Then he got the idea to come up with a memorable name, hence Steve Brodie—fashioned after the famous New York saloon owner who, in 1886, claimed he jumped off the Brooklyn Bridge into the East River. Pulling a “Brodie” soon became synonymous to publicity stunts. When casting agents assumed he was related to the famous man, he didn’t correct them and soon began receiving acting jobs. An MGM talent scout saw him and brought Steve to Hollywood as a $75 a week contract player. His first film was “Ladies Courageous” with Loretta Young in ‘44 (on loan-out to Universal). Unfortunately, he was dropped by MGM after a year. 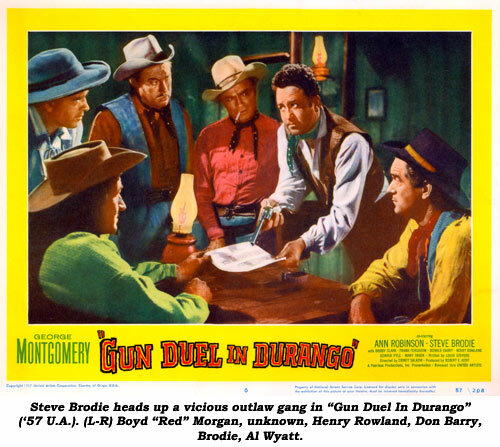 He freelanced for a while and was then signed by RKO, along with good friend Robert Mitchum. 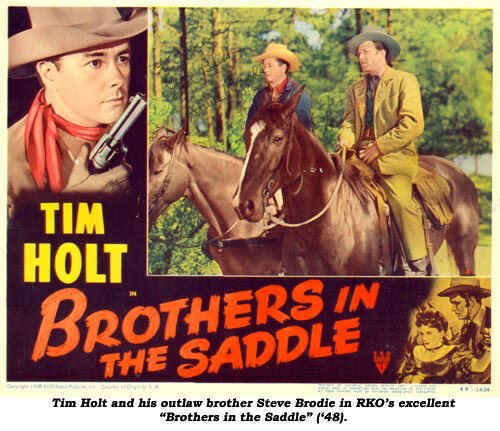 Steve was first married to actress Lois Andrews (with whom he later worked in Holt’s “Rustlers” in ‘49). They had two sons and the marriage lasted til her death in 1968. One son was director/actor Kevin Brodie. Steve later married Virginia Carol Hefner and they lived on Sunnybrae Avenue in Canoga Park, California. Steve worked in films and on TV heavily til ‘68-‘69, at which time he slowed down considerably. He made a bit of a comeback in ‘75 starring in “The Giant Spider Invasion” alongside former RKO stablemate Barbara Hale. But his appearances on TV after that were scant and the few films he did were ones he probably shouldn’t have made. Apart from westerns, he starred in a few B-pics at RKO such as “Desperate” (‘47), but really made a mark in several classic A films. He was part of the Texas Division platoon who took “A Walk in the Sun” on Salerno beachhead in ‘45. He was Robert Mitchum’s blackmailing private eye partner in the film noir “Out of the Past” (‘47). He was Robert Ryan’s drunken and sadistic ex-Army buddy helping to beat to death Sam Levine in Edward Dmytryk’s controversial “Crossfire” (‘47). He was Academy Award material as the bigoted corporal in Stanley Kramer’s “Home of the Brave” (‘49). 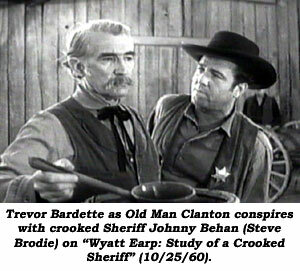 But still, it is the western films and TV shows for which we best remember Steve—the Tim Holt and Randolph Scott westerns…and his portrayal of vicious Sheriff Johnny Behan on TV’s “Life and Legend of Wyatt Earp” from ‘59-‘61. 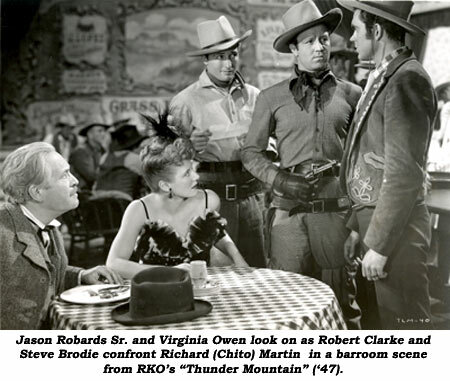 Steve was also seen on “Lone Ranger”, “Wild Bill Hickok”, “Stories of the Century”, “Sugarfoot”, “Wanted Dead or Alive”, “Maverick”, “Cheyenne”, “Bonanza” and others. Steve died January 9, 1992, at Humana Hospital in West Hills, California, of cardio respiratory arrest and myocardial infarction. Lactic acidosis and esophageal cancer were also contributing factors. His remains were cremated and taken to the family home.